The area's premier networking and business information event every month! 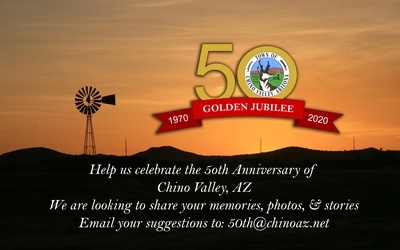 Come and get the scoop on Chino Valley's 50th Anniversary Celebration. Hear it here first!!! What's the plans, what to expect and they are currently working on. Hwy 89 & Outer Loop Rd. $16 for CV Chamber Members pre-registering online. $19 for Non-Members pre-registering online. $21 at the door with no registration.